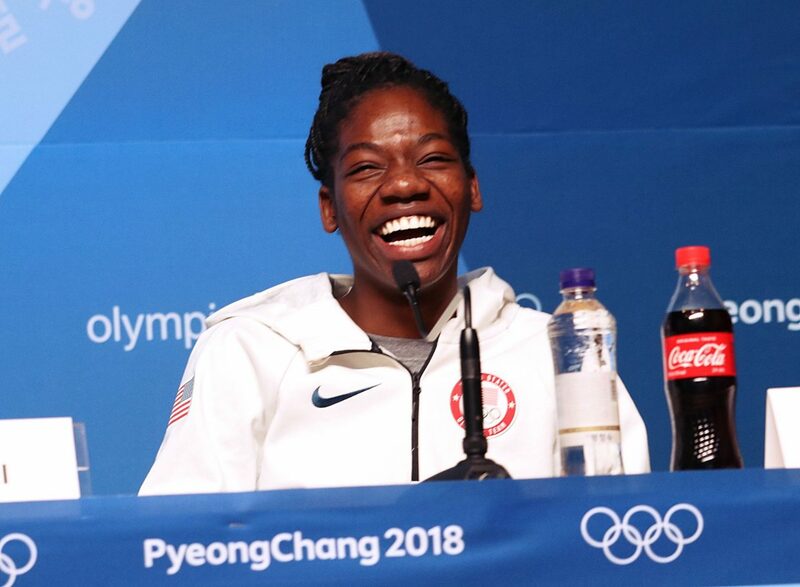 U.S. Olympic short track speedskater Maame Biney laughs during a news conference on Wednesday, Feb. 7, at the Main Press Center of the Pyeongchang Winter Olympics in Pyeongchang, South Korea. PYEONGCHANG, South Korea — Maame Biney finally got an iPhone, and she was extremely excited. It’s silver. She wanted rose gold. But that’s OK.
“Because I got a phone, which is all I’ve ever wanted,” she said, giggling. The 18-year-old short-track speed skater with the ebullient personality is poised to become one of the biggest faces of these Winter Games. She’s already made history as the first African-American female speed skater to qualify for the Olympics. 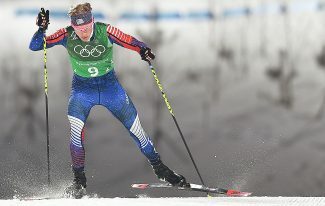 Soon she will compete as the American women’s best shot at a medal the 500 meters. She’ll also compete in the 1,500 meters. She came to the United States from her native Ghana at age 5 to live with her father, Kweku. Months later, Maame took up speedskating after her father spotted a sign for lessons along the road. Maame and Kweku lived in Maryland and then Virginia; her mother and brother still live in Ghana. She credits her father for helping her achieve her skating success to date. “This has a been a very long journey for my dad and me, so I’m excited my dad’s here to experience this,” she said. 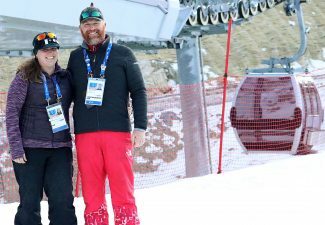 Last year, she moved to Utah to train at the Utah Olympic Oval in Kearns. 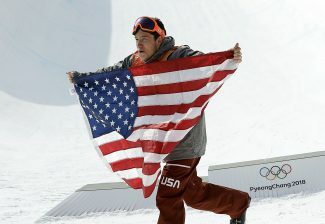 She moved in with a host family, the Sorensons, in Park City for seven months. The daughter, Abby, who is 14, became like a little sister to Maame; they’d watch movies like “Star Wars” together. After graduating from high school in Virginia later this year, she’ll return to Utah, where she has been accepted into the University of Utah. The media attention has been intense, especially after her win at the Olympic Trials in December. 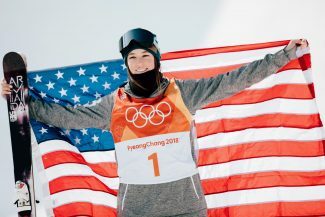 That includes working on breathing exercises with a specialist on the U.S. Speedskating Team to help mitigate the stresses that have come with her success. 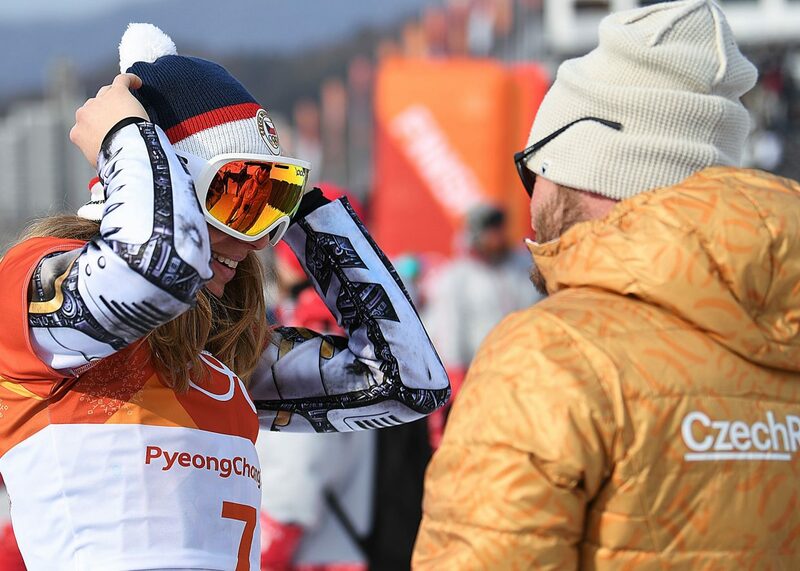 On Wednesday, she was excited that her dad had landed in Seoul and was making his way to Pyeongchang. “We haven’t texted yet,” she said, then added with comedic flourish, “on my new iPhone 6,” waving it to reporters, smiling, and bursting into laughter yet again.